Gorilla Glue, get the job done right for the first time- every time. When exposed to moisture the adhesive reacts and creates a foaming action that fills whilst it sticks. Gorilla Glue has an open working time of 20 minutes. The glue is brown in colour, but when dry it dries a tan colour, and is totally waterproof. 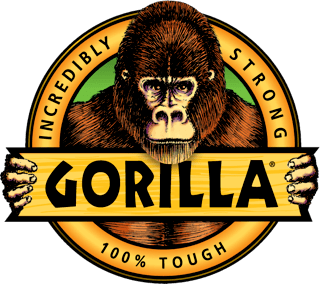 Gorilla Glue is incredibly strong, bonding all types of wood, including pressure treated wood. Gorilla Glue also bonds stone, metal, ceramics, foam, glass, leather and more. Once dried the product is sandable, stainable, paintable and can also take a varnish. Due to its foaming action the glue gives greater coverage, so will give 3 times the coverage of other glues. The glue is unaffected by extreme hot and cold, and will not break down when exposed to rain and snow. Originally used as a commercial adhesive for hard-to-glue materials. Once something is glued it will not come undone- it is set to survive years after the repair. The Gorilla Glue polyurethane formula bonds materials that typical all-purpose adhesives will not hold, including wood, stone, metal ceramics, glass, foam and more. And even better - it bonds dissimilar materials.It is waterproof and temperature resistant, which means it can be used for projects and repairs indoors or out.